A Celebration and a Giveaway. 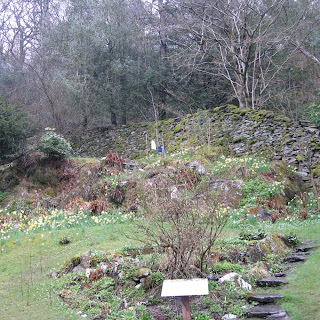 We recently returned from a family holiday in The Lake District where we did a little walking and visited old haunts. The weather had finally turned from bitingly cold to warmer and wetter, more typically bright and breezy days. 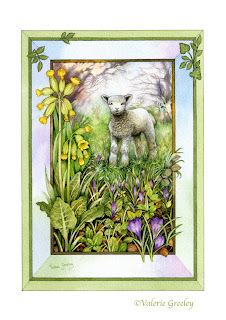 The fells were dotted with newborn lambs and daffodils dutifully danced in the breeze. It was my first time to climb to the top of Orrest Head; that is me in the photograph, hanging on for dear life as it was extremely windy and head staggeringly high, although the image looks deceptive. The view from the top is wonderful and you can see for miles in all directions. Hills, mountains, lakes and valleys with Lake Windermere being the closest. 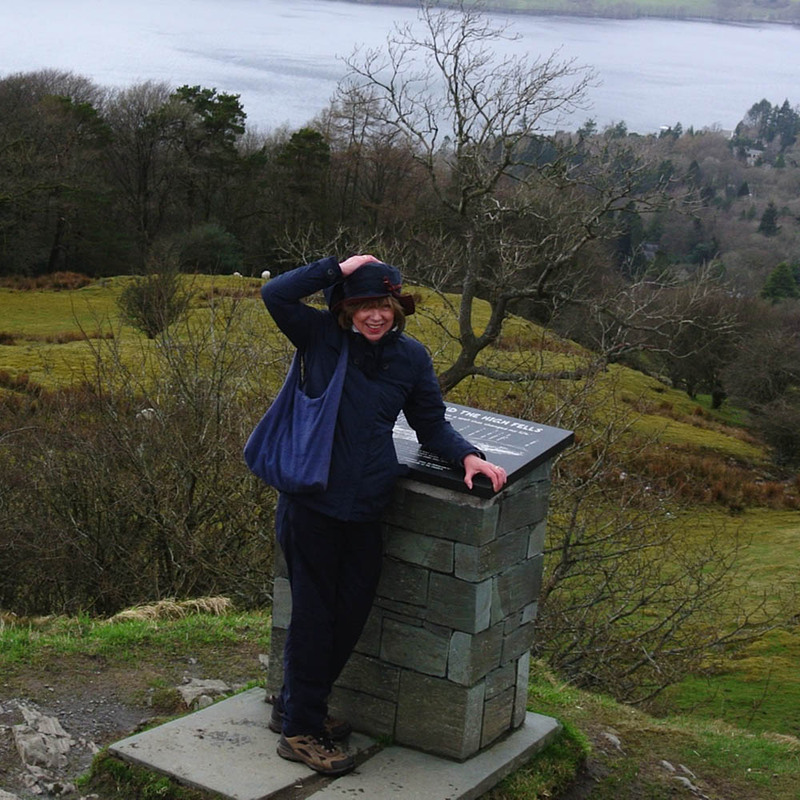 Wainwright said of this place “Those few hours on Orrest Head cast a spell that changed my life forever”. I have always loved the Lake District and have fond memories of childhood visits with my parents and later as a pupil. Our school had a house on the shores of Lake Coniston and we would stay there on field trips. Years later we went as students and visited Dove Cottage. 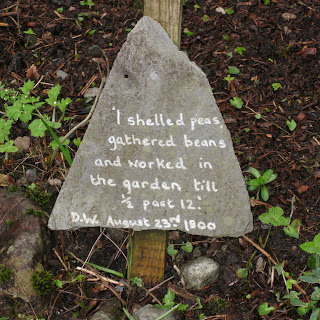 It was the garden at Dove Cottage that made a lasting impression on me, so much so that I was reluctant to visit again in case the spell was broken. 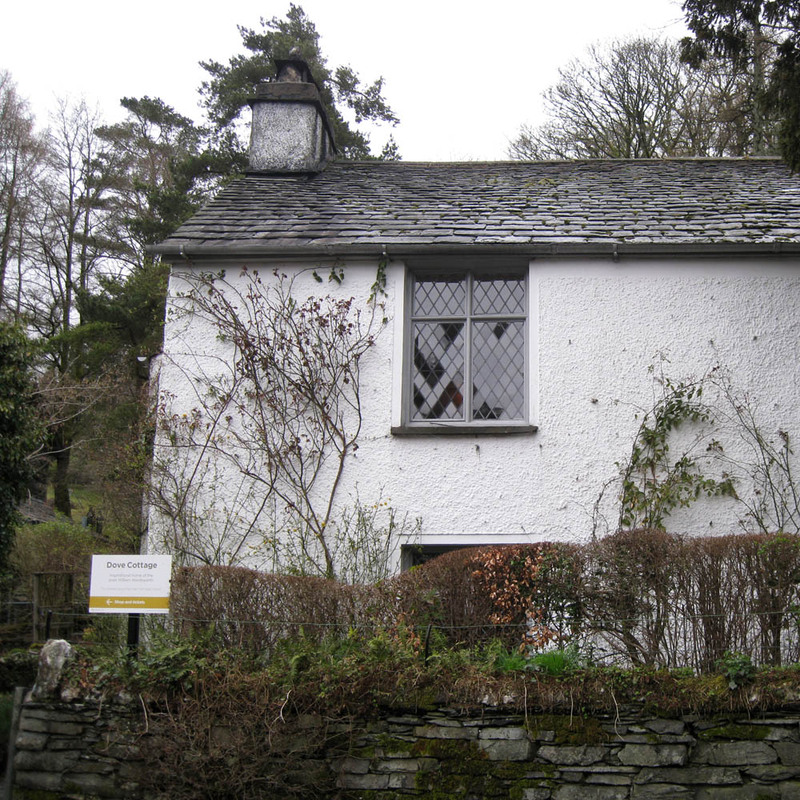 It was the home of the poet Wordsworth where he lived with his sister Dorothy and it was here that she wrote her now famous journal and shared the delights of her beloved garden. I particularly loved the view of the garden from the little kitchen window. The garden is very steep and climbs up the hillside in such a way as to present the viewer with a green tapestry, filling the window frame with layer upon layer of lush vegetation. This time it was daffodils but the first time I went the entire garden seemed to have been embroidered with wild strawberries. When you climb to the top of the garden path you can see way above the rooftops to Grassmere and the surrounding mountains. Wordsworth loved this place and referred to it as “a love within a love”. I wonder if Dorothy would have kept a blog had she been alive today? She certainly had many interests; her love of nature, her garden and poetry would have been well suited to the medium of the blog. All of which brings me to my little celebration; on the 25th of this month this little blog will be five years old! I have never been very good at journal keeping and any diary I have attempted to write has been short lived, so it has been interesting to look back on the past five years via these posts. I thought it called for something of a celebration and so I am having a little give away. 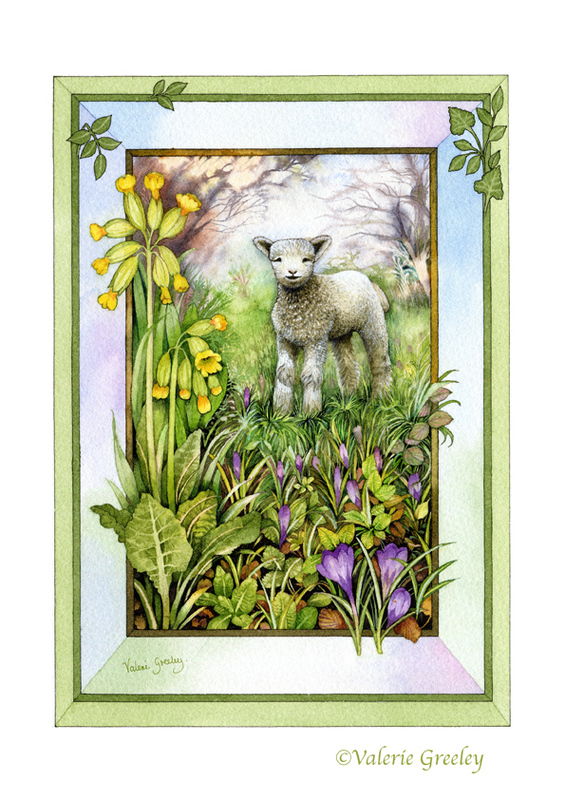 On offer is a “Little Lamb” (see above) print of an illustration I did for “A Book of Days” which was first published in 1984. Goodness how time flies, my work is now vintage! You can read a little more about the print here in my Etsy shop. If you wish to take part in the giveaway, please leave me a comment indicating your wish to do so. If you have a special place that you hold dear maybe you would like to share it with us? I will choose a winner on Sunday May 5th. We recently visited The Staffordshire Hoard exhibition at the Potteries Museum in Hanley. The largest and most valuable Anglo-Saxon treasure ever found. You might expect work done so long ago in “The Dark Ages” to be lacking in finesse, nothing could be further from the truth. The level of craftsmanship in this beautiful collection of gold and garnet artifacts is quite staggering. It put me in mind of “The Byzantium” exhibition we saw at the Royal Academy some time ago. 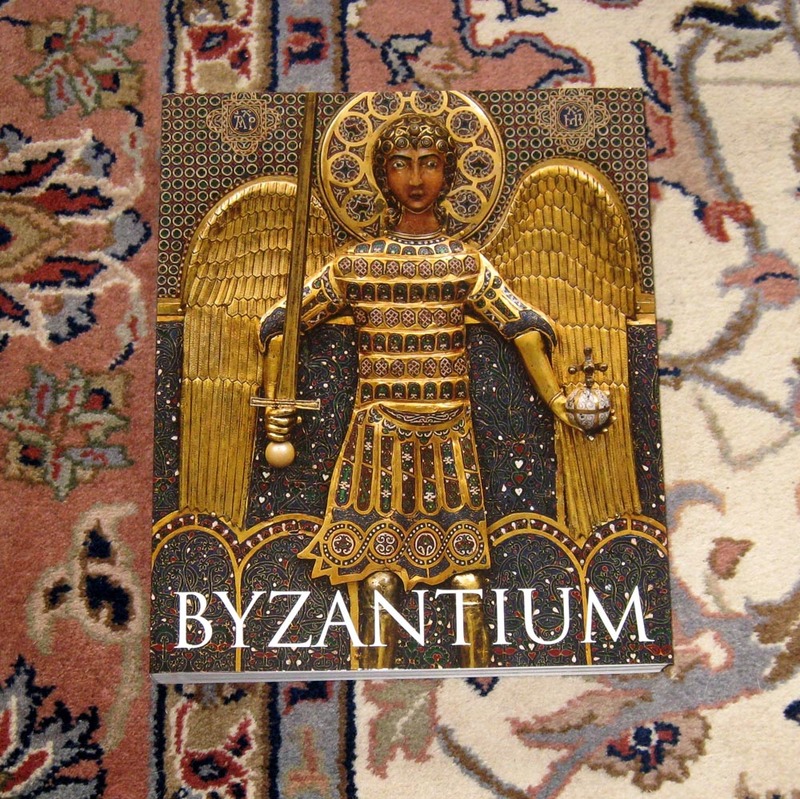 Fortunately I had invested in a copy of the book which was sold alongside the show, it was good to be able to use it for reference to a new project that I am working on. 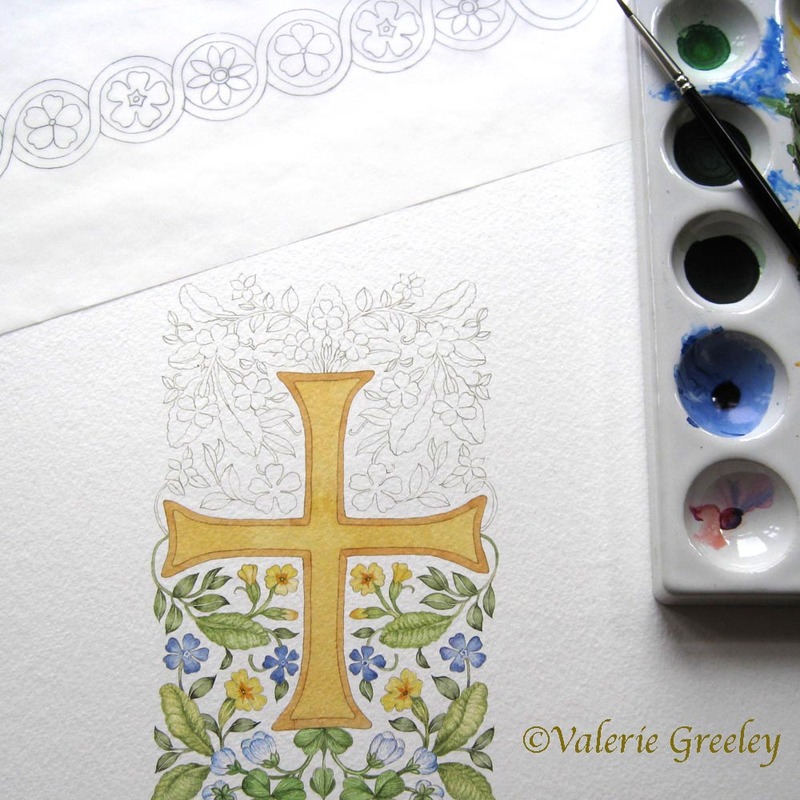 Both exhibitions feature delicate and very decorative gold crosses and I decided to make this a starting point for a new design. I incorporated spring flowers, giving them a very formal, symmetrical structure. You can see a glimpse of the work in progress here. I added gold ink decoration at a later stage. The temperatures around here have been unusually cold and my poor old mum has been complaining of very cold feet. 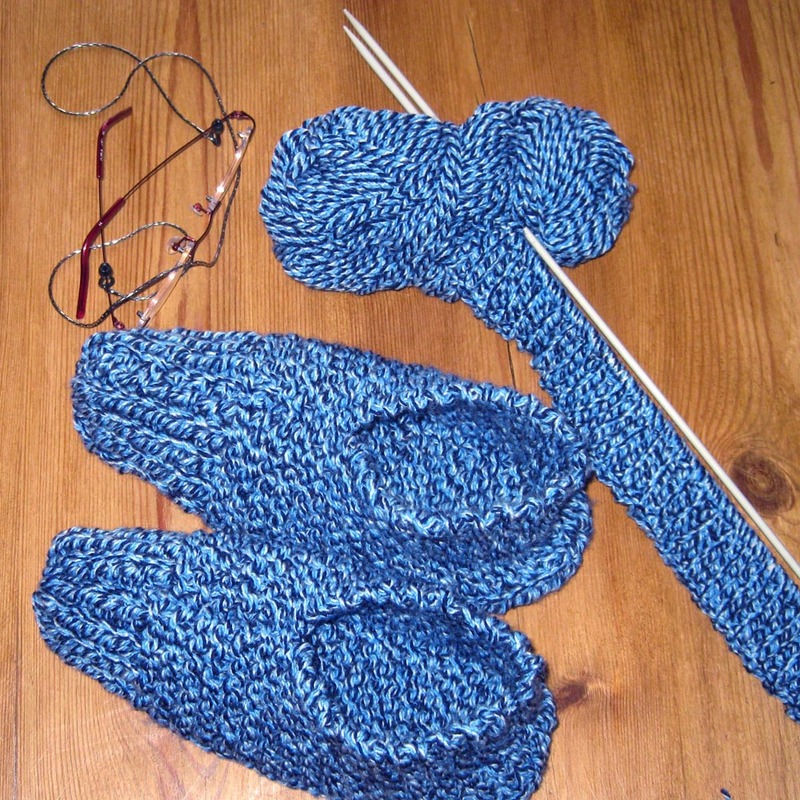 All the shops are full of spring attire so I decided to pick up my knitting needles again and have a go at making some. I found this pattern called “Aunt Maggie’s slippers” by Beverly A Qualheim on the Ravelry site available as a free download. I have to thank Annie from Knitsofacto for inspiring me to knit again after many years of abstinence, although I haven't been brave enough to tackle her patterns yet. I think I need to brush up on my skills somewhat but I have my eye on her Downton Hat. Isn’t the internet a wondrous thing? I think I gave up knitting when the local wool shops closed their doors. 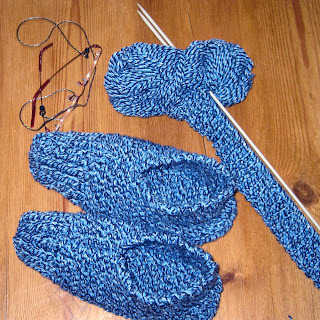 The little shoe/slipper pattern is ingenious and very easy, knitted on just two needles. Miraculously it sews up into a little shoe. I can imagine these little slippers to be made of chain mail and worn way back in “The Dark Ages” or am I being a little too fanciful? Maybe.